CM2200 Mobeye ThermoGuard remote temperature sensor with GSM alarm. The Mobeye ThermoGuard remote temperature sensor is a simple and excellent instrument for remote temperature monitoring and reporting. The module can run on its batteries which makes the compact product work autonomously for over 12 months. Upper and lower limits for the temperature alerts are easily set. As soon as the ambient temperature moves out-of-range, the GSM dialer within the remote temperature sensor alerts of the recipients whose mobile numbers have been programmed in via SMS text messages and/or a phone call. The Mobeye ThermoGuard alerts you during freezing or overheating and avoids additional costs caused by burst pipes or over-heating servers etc. 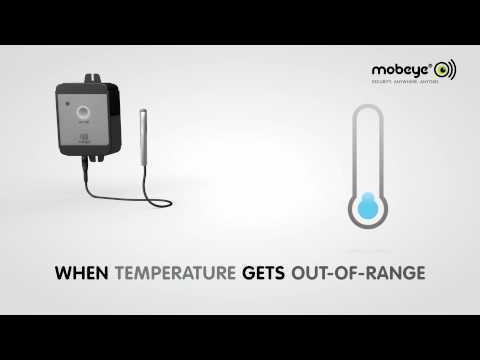 A maximum of five numbers can be programmed in to the Mobeye remote temperature sensor. The temperature range can be set anywhere between -20 to + 70 Celsius. In addition to the temperature sensor another two external sensors can be connected to the Mobeye; two additional inputs can be set to 'Normally Closed' or 'Normally Open'. In this way any dry contact can be applied. Although the Mobeye ThermoGuard remote temperature monitoring unit has been designed for an extreme low power consumption and it runs on its batteries for more than a year, an external power supply could be used as well. By using a (regulated 500mA) 12v DC adapter the module can be mains powered. Upon power failure the back-up batteries take over functioning and the system alerts the power outage via an SMS message. Users provide their own SIM card from any network provider. Compound Security Systems advise the use of a monthly or annual contract SIM card. Pre-paid cards are accepted as well, but the user needs to keep an eye on the SIMs credit level and validity.